This, essentially, is a cloud-based service designed to help software application development professional to proactively monitor the maintainability and analysability of Mendix applications. Okay sorry, well at least the firm didn’t say maintainable-ness — it’s not so hard to clarify what is going on here. The comments here relate to a point highlighting technical debt as the loose ends that need resolving (and the refactoring that is required) as a result of the development process. “The debt may take many forms, from design debt, to documentation debt, to unused and duplicated code. Addressing technical debt ensures that the software is well-architected, well-written and maintainable,” says Gartner. … and the point is, too much messy technical debt and you get an application with poor maintainability. Mendix says it is the platform of choice for top brands implementing bimodal IT — an approach combines the solid capabilities of conventional IT with so-called Mode 2 capabilities that enable the speed and agility required for digital innovation. One of the most common mistakes CIOs make when implementing Mode 2, however, is failing to maintain a disciplined focus on refactoring, resulting in ballooning technical debt. The analysis here covers key aspects of the application such as analysability, modifiability and modularity. It rates the application for parameters like volume, duplication, unit complexity and dependencies. 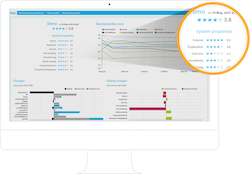 A dashboard offers the quality rating on a scale from 1 to 5, and highlights potential areas for further investigation. The ratings are based on benchmarks of thousands of projects. 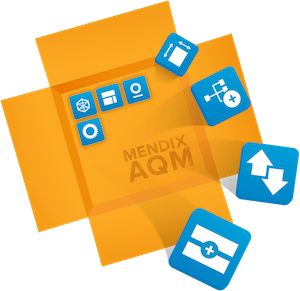 “The Mendix Model API offers an open, metadata-based approach allowing specialist tools to analyse the software quality of Mendix models in real time. Rather than performing quality analysis retrospectively, the Mendix Application Quality Monitoring service offers immediate visibility into the maintainability of applications as they are developed, helping to eliminate and prevent technical debt. We know of no other development approach that offers this level of integrated quality assurance,” said Roald Kruit, Mendix co-founder and leader of the Mendix Digital Transformation Practice.